We started our journey to learn about the Huron-Wendat at Parc Omega. This totem pole at Parc Omega tells the story of the creation believed by the Huron-Wendat. 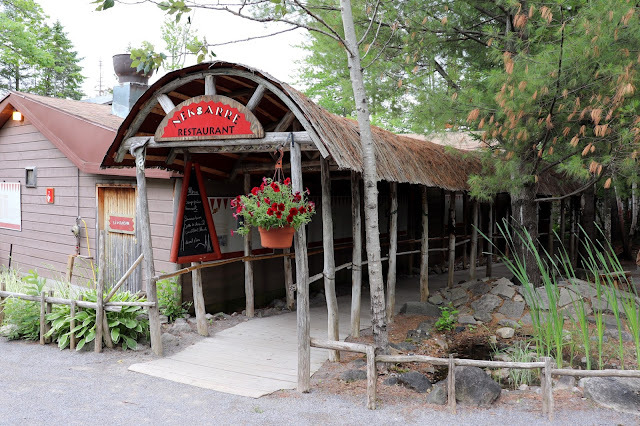 Our first stop in Wendake, Québec was for lunch at the Nek8arre restaurant within the Huron Traditional Site. The three course meal started with sunflower seed soup and bannock. For the main course we chose fish cakes served with a wild rice mix and seasonal vegetables. Maple cake and cranberry tea was served for dessert. It was a satisfying, delicious meal with simple flavours. 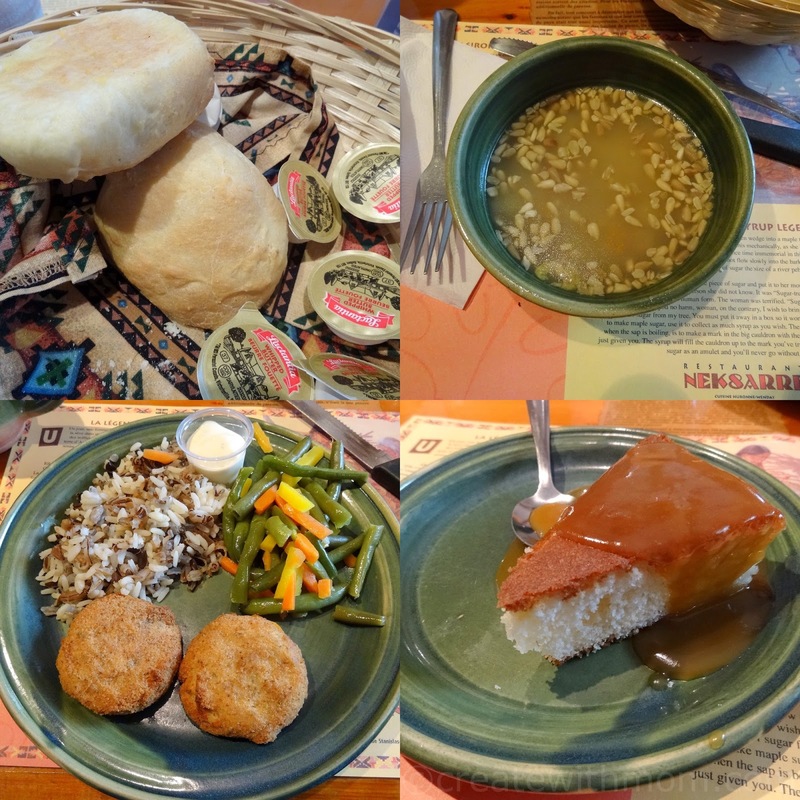 Nek8arre restaurant has a variety of dishes from the Native traditional cuisine, which includes elk, deer, buffalo, salmon, and trout. 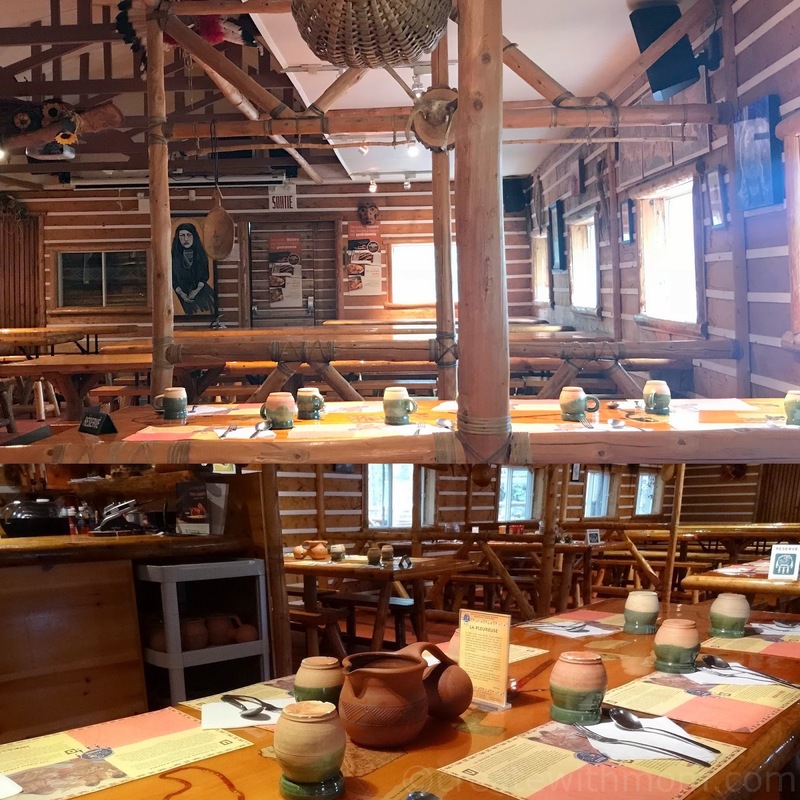 The rustically decorated dining room has lots of interesting and cool décor from antlers to woven baskets, and an array of beautiful clay pottery to serve water and tea. We can either dine inside or outside in their shady terrace, which is open during the summer season. Huron Traditional Site in Wendake is an experience everyone must have! The rich cultural experience we had here is unforgettable. The site is located 20 minutes away from Québec City at 575 rue chef Stanislas-Koska, Wendake, Québec, G0A4V0. 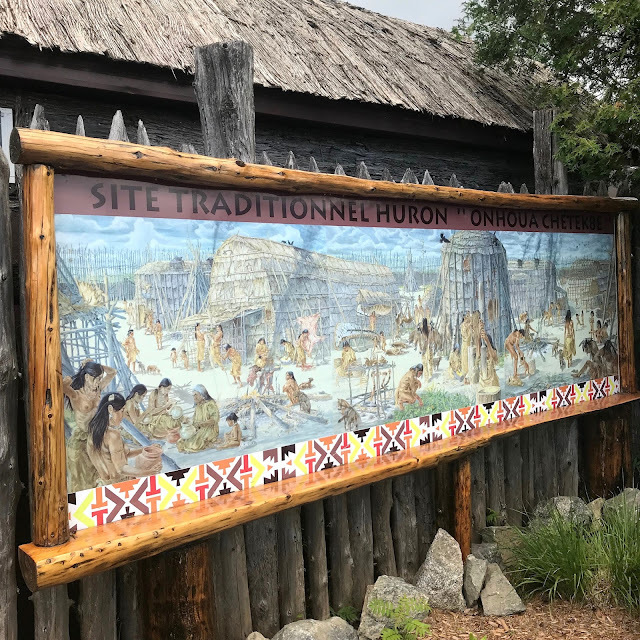 This reconstructed village on the Huron-Wendat reservation is a wonderful place to learn about First Nations and how they lived before the Europeans settled. At the site, we had an opportunity to ask curious questions from our knowledgeable First Nations guide dressed up in traditional clothing during the 45 minutes tour. 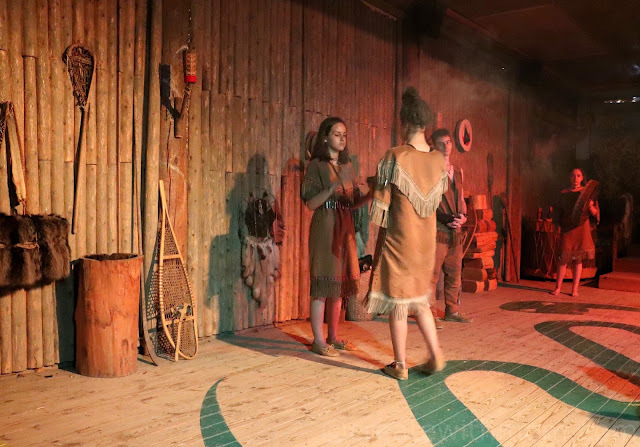 The tour started with a traditional welcoming dance show, the first part of the video above will show you a glimpse of the dance. Next, we went inside a longhouse, the traditional house of the Wendat. 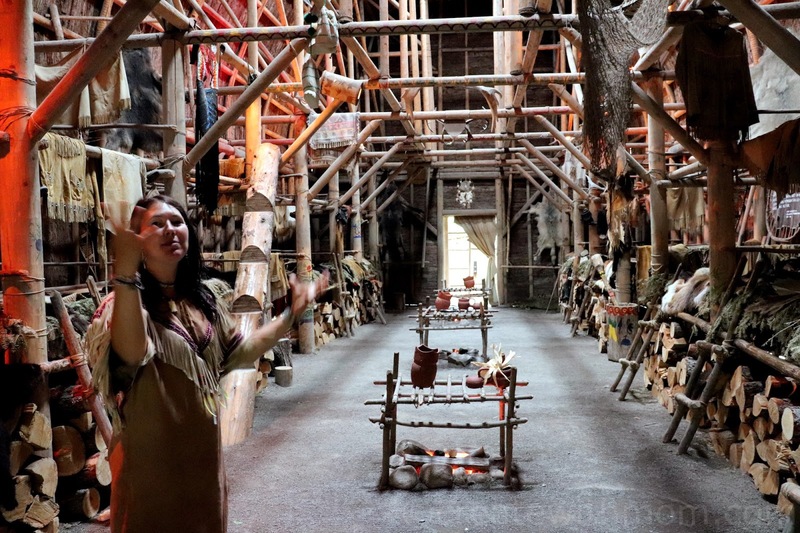 We learned how families would have shared, and lived together, how each section of the longhouse was used, different responsibilities of each member, how they chose partners for marriage and the chief, and more. 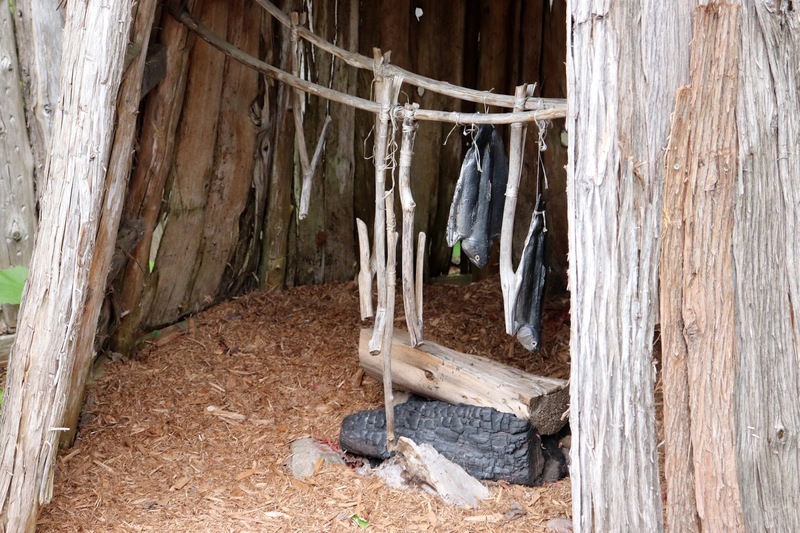 We then learned how they preserved food through the methods of smoking and drying the meat and fish for winter. Eighty percent of the Wendat people's diet was corn, squash, and beans. It was mainly women who cultivated crops, and preserved it for winter, while the men hunted and fished. This group of vegetables formed the Three Sisters because they helped each other grow, as corn stalks provided natural poles for the beans to climb, and the beans in turn gave nitrogen to the soil, which is essential for corn. The broad leaves of the squash gave shade to help conserve moisture and prevent the mound from being infested by weeds. They also grew sunflowers for their oil and to attract nectar gathering insects, and planted Jerusalem artichokes for its tubers that resemble small potatoes. The Sweat lodge was used as a purification technique done by the men. 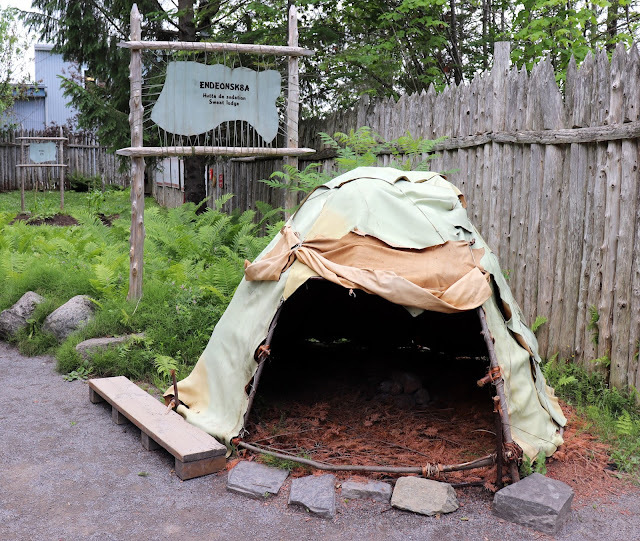 We went inside the giant tipi to learn about First Nations people from different parts of Québec. Then we entered a space that taught us about the traditional methods of healing. 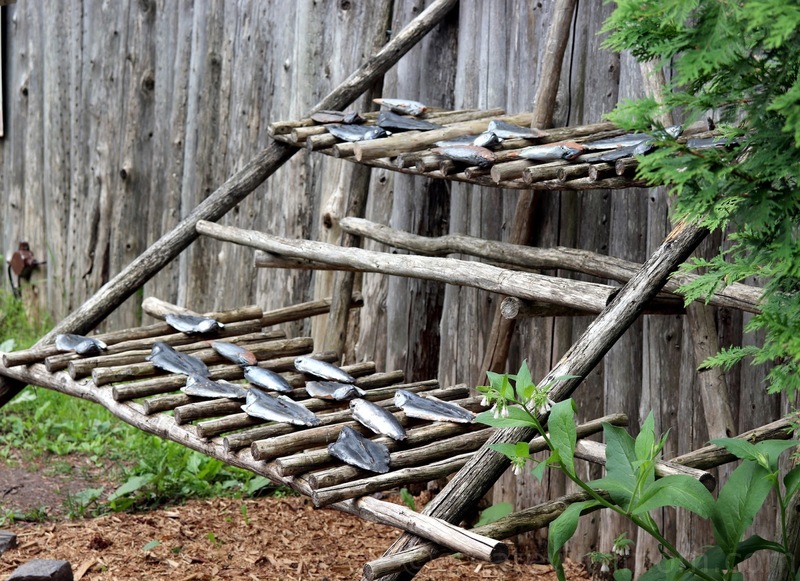 We also saw different methods of traditional transportation such as birchbark canoes, toboggans, and snowshoes. At the entrance we learned to play a traditional game by picking up the sticks without making the structure fall. We also had fun participating in archery. The tour ended with a traditional dance ceremony, that we enjoyed watching. You can watch a glimpse of this in the second half of the video. We also had the opportunity to participate in the Traditional treaty ceremony. 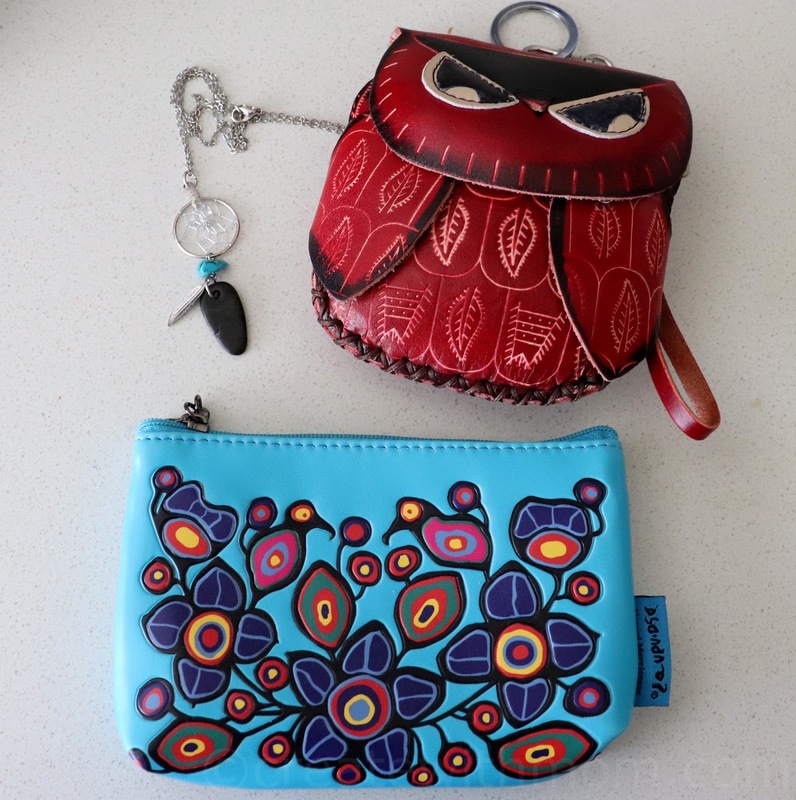 Before leaving the site, we bought some awesome traditional handcrafts at the Le Huron boutique. 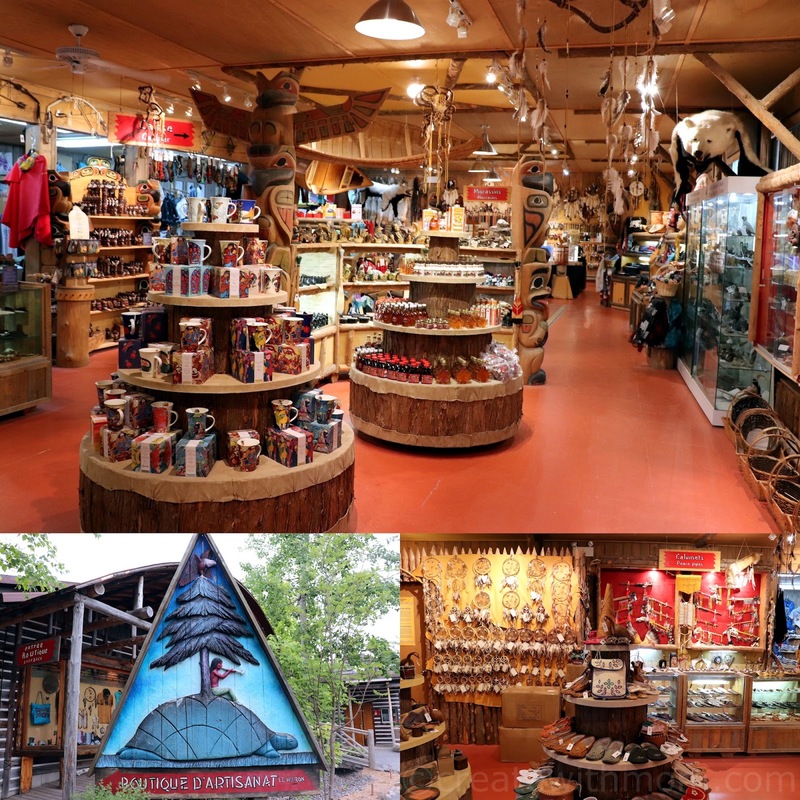 This boutique offers a large variety of Eastern Canadian Aboriginal arts and crafts objects, and has been recognized worldwide for three generations for its authenticity. There are over 5000 items from books, music, jewellery, fashion products, home décor, and more to choose from and it is tax free. This site is open every day of the year except December 24, 25, 26, 31st and January 1st and 2nd. The guided tours are offered in French, English, and Spanish. 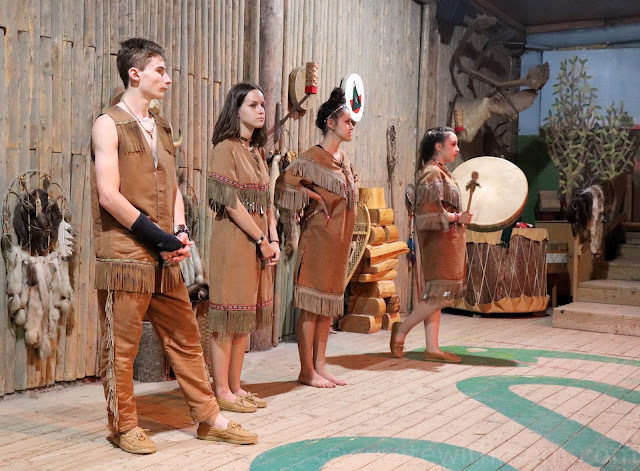 They have a variety of packages that include canoe rides, snowshoe tour, arts and crafts, tales and legends, native games, and more. 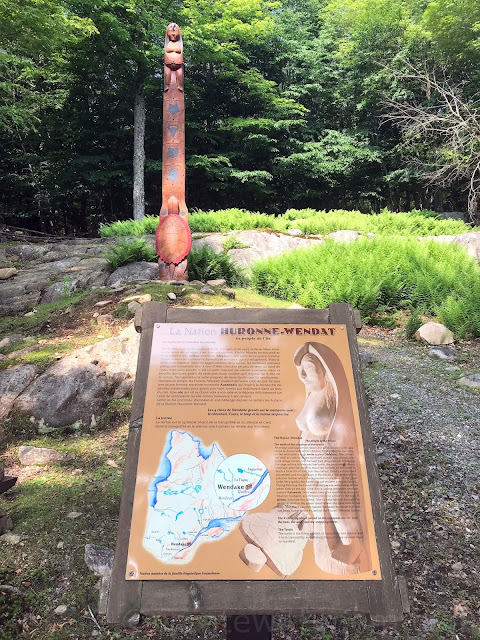 There are a lot of activities to do while at Wendake, more about it on the next post. 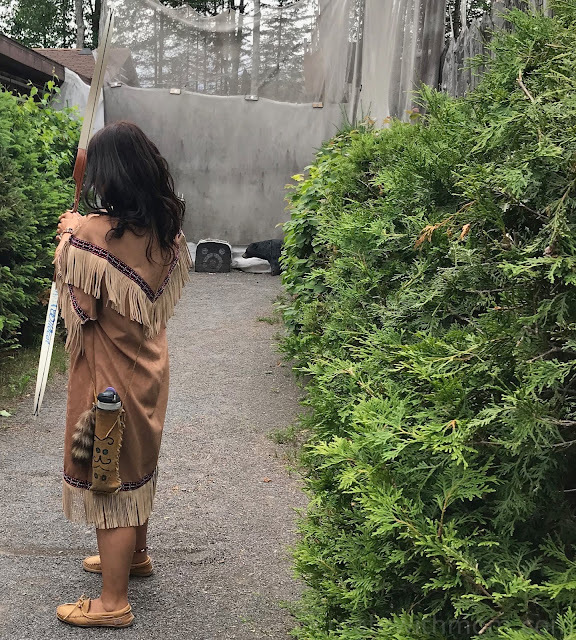 It felt good to feel a sense of community at the Huron Traditional Site. Exploring the space with the guide and partaking in the activities gave us a different perspective, and made us feel more connected. 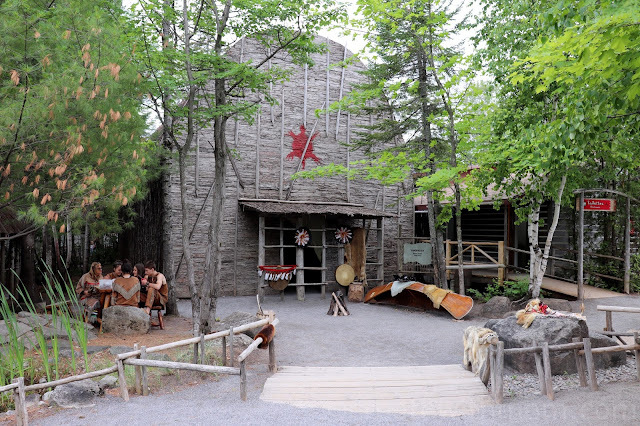 This would be a wonderful place to take my kids next summer when we visit Quebec. 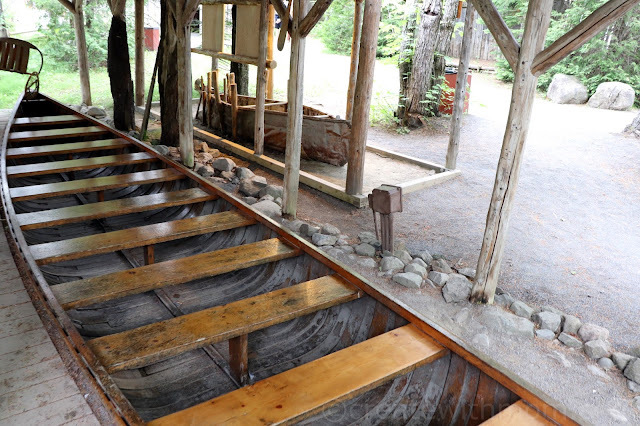 We have a lot of First Nations culture here in BC and I think they would find it interesting to visit a traditional site elsewhere in Canada. I'd love it too! This looks like such an interesting place. I would love to try their bannock and the maple cake looks irresistible! such an amazing place to visit. one day would love to see it! Would be an interesting experience, and a great tool for education. I feel I lack so much knowledge about Canada's Indigenous heritage. This would be a wonderful and oh-so-needed experience, thanks! 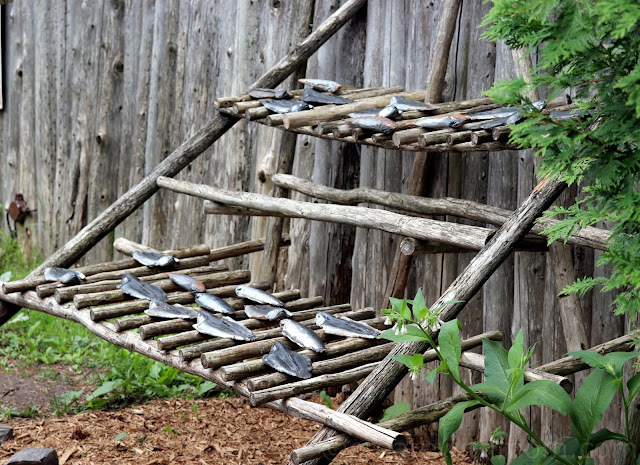 This looks very interesting and I would love to spend time exploring, perhaps next time we get over that way! 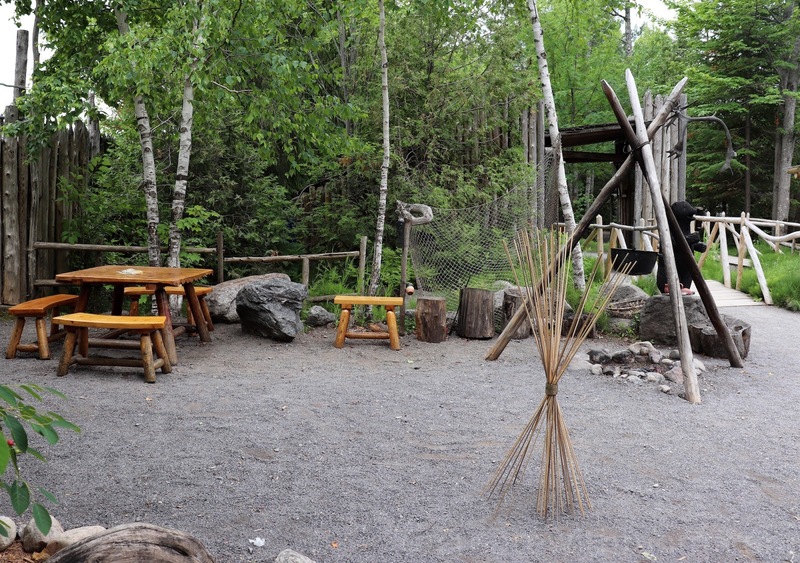 Love the fact that there is a traditional restaurant on the site, that would be a neat experience! Wow this looks interesting and like something I'd really enjoy doing myself! I would very much enjoy visiting this place. I love this article because you've posted so many pictures and shown how beautiful this place is. Thanks I really enjoyed the video ! The totem pole is amazing,I love looking at them ! Looks like such a great place to visit. The Nek8arre restaurant food looks so good! Love to try the traditional restaurant! The food looks so delicious ! That looks both interesting and educational! What an interesting place to experience and see all the traditions and culture! Love to visit one day! I would sure love to try the sunflower seed soup. Would love to try the foods from the the Nek8arre restaurant. I would love to learn more of our countries history! I love when they dress in traditional clothing,I love going to our Annual Powwow celebrating the Mi'kmaq Culture.